Last year for my New Years Resolution I made up my mind to take Sadie’s soother away. So on Jan. 1 the soother was gone and never to return. It was actually the first New Years Resolution that I kept…cheating maybe? Whatever works. This year I will let Sadie make her own. My New Years Resolution is to become more organized. It is so easy to come home and throw everything down and do nothing for the night and pick up all the clutter on the weekend. But even weekends are becoming so busy that it just keeps piling up. Lists are lost, bills are misplaced, appointments are missed all because I haven’t kept up with being organized. Thanks to the 2011 My Life Matters planner, I think it will be a well kept year. This planner has EVERYTHING you need to keep you going day to day without missing a beat. Filled with valuable information about your health and what you should be having checked at your age, phone numbers, monthly goals, divided sections for each month, a personal budget and so much more. 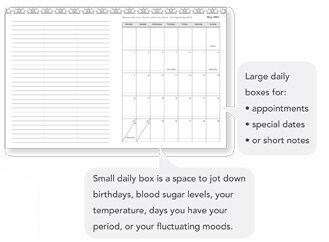 You have the full monthly calendar to look at and it is also divided into daily slots for each day to track what needs to be done each day. It even has places to check for your daily food intake, water and medications. The planner comes geared for 6 months and $26.95 or the full year for $49.95. Its time for me to start looking after me and my surroundings and this Planner is just what we all need to help us start 2011 organized. Check out the planners at www.womansplanner.com and order yours today. Such a cool Physical Health section, allowing you to track vitamins, workouts, sleep and food groups! There’s even a place for you to mark how many cups of water you’ve had!